This Tustin-Rose Grade Separation Project included raising the Tustin/Rose Avenue arterial over the existing dual Burlington Northern Santa Fe (BNSF) railroad tracks, Atwood Channel, and Orangethorpe Avenue via one 450-ft long four-span, six-lane wide bridge founded on ten 96-inch Cast-In-Drilled-Hole (CIDH) piles and 107 steel driven concrete piles. The bridge is innovative in that it couples a typical Caltrans box girder bridge with pre-stressed concrete girders over the BNSF tracks to eliminate the need for falsework adjacent to the railroad tracks. The project included a time- sensitive, four-lane temporary bypass road with an on-grade railroad temporary crossing and a temporary bridge spanning Attwood Channel. Other improvements included constructing a new connector road, with a landscaped ADA compliant pathway, that will also provide a new entrance to the Del Cerro Mobile Park, four mechanically stabilized earth retaining walls, one soldier pile retaining wall, two sound walls on retaining walls to mitigate noise at the Del Cerro Mobile Park and numerous utility relocations. Agreements with adjacent property owners, work restrictions at the Army Core of Engineers (ACOE) / Orange County Flood Control District (OCFCD) Atwood Channel, and the railroad’s “fourth quarter no impact” periods added significant challenges to the project’s schedule; however, by applying numerous lessons learned, Jacobs delivered the project on time. Jacobs provided construction management services, community outreach/public relations, construction survey services, material testing, and source inspection services for this project. Our team, led by the Jacobs Resident Engineer, performed all QA field inspection, both roadway and structures, reviewed submittals, request for information (RFI), contract change order requests, schedule reviews, documentation of all material testing, and coordination with OCTA, BNSF, ACOE, OCFCD, City of Anaheim, City of Placentia, Southern California Edison (SCE), The Gas Company, AT&T, Time Warner Cable (now Spectrum), Orange County Sanitation District (OCSD), and Golden State Water Company. The Jacobs team provided full time and 100% dedicated Construction Management services to the project and client. Jacobs was fully committed to assuring a successful project for all parties involved and fully embraced the owner directed Partnering requirements of the project. Jacobs provided numerous solutions throughout the project that resulted in both time and budget savings. All formal communications went through the two designated representatives established for the project, the Resident Engineer and Contractor’s Project Manager. Our team was in constant communication with OCTA, USS Cal Builders, BNSF, City of Anaheim, City of Placentia and all the utility companies involved with the project. Informal communications were allowed, provided that all concerned team members were notified of the results either at the weekly project meeting and confirmed by email. The owner (OCTA) procured office space which allowed the Contractor and CM to be co-located in adjacent office spaces allowing face to face communications on a moment’s notice. Weekly progress meetings were held that included USS Cal Builders, OCTA and other stake holders as needed. RFIs and shop drawing submittals were addressed in each weekly meeting to ensure no bottle-necks developed in the communication channels. Three-week look-ahead and monthly schedule updates were shared among all stakeholders to ensure everyone was on the same page for upcoming deliverables and addressing team challenges together. We addressed conflicts without delay. Our team facilitated strong communication among all project stakeholders, including OCTA and the entire team. With the entire project team co-located and empowered to make real-time decisions; issues did not escalate and were easily resolved. A Claims Settlement Conference was attended by OCTA, USS Cal Builders and any other stakeholders, was established for formal dispute resolution. Both the Contractor and CM managers met with OCTA’s Construction Program Director to discuss the claim in detail. •	If an agreement is reached, it is reduced to writing and OCTA and USS Cal Builders sign the agreement before the meeting is ended. •	If an agreement is not reached, the parties can either agree to a second session, within 5 days, or agree that settlement of the claim is not possible. In addition, a partnering escalation ladder starting from the field inspection to the OCTA Program Manager and Field Superintendent to the Vice President for USS Cal Builders was established for resolution of the disputes. For a project of this magnitude and complexity, there were only six (6) claims which were resolved via the claims resolution process in the contract and were resolved using the partnering ladder. No claims were resulted in litigation. This was estimated to have saved over $500,000 to each of the parties in litigation and other legal procedures for claims resolution. Some of the challenges included working with BNSF and live train traffic, coordinating with BNSF flagmen daily, installing a temporary grade crossing and scheduling the work to consider BNSF’s 4th quarter restrictions limiting work within the BNSF Right of Way. 1. The additional deck top reinforcing steel had to be cast in the box girders and span over bent caps into span 2 about 30 feet. This was the only way this could be done to avoid conflict with erection of precast girders was with use of ultimate but splices. Close coordination between the Jacobs team and the designer was required to allow for the splices. 2. The longitudinal clearance from end of precast girders to the reinforcing steel in the bents was only 2-inches. With the CM’s proactive approach to survey girder seats at the bent cap for elevation, alignment and distance all girders were set in place without any issues. The bridge is innovative in that it couples a typical Caltrans Cast-in-Place (CIP) box girder bridge with pre-stressed pre-cast (PS/PC) concrete girders over the BNSF tracks. eliminating the need for falsework around or near the BNSF tracks. This allowed BNSF to be flexible during the fourth quarter restriction period and allow some work to be performed which helped the contractor gain some lost time. Additionally, the approaches to the bridge where retained by MSE walls. The specifications required settlement periods for the MSE walls to be completed prior to construction of abutments. To save time, the Jacobs team worked with the designer and USS Cal Builders and recommended if the H-piles at Abutment 4 were extended to account for the down-drag force, the abutment could be constructed during the settlement period at Abutment 4 (critical path) at the time. The contractor agreed at no additional cost which resulted in 30-day savings to the contract. Throughout the project, we fostered an environment of collaboration and partnership between the Owner, Designer, Construction Manager, and the Contractor. Formal partnering was used on the Project. In addition to formal partnering sessions, the CM team and the Contractor worked together through informal partnering to resolve issues and disputes. All team members had an open door policy to address any potential issues before becoming a conflict at the field level. If necessary, meetings were held to address any disputes or conflicts and to resolve them by the end of the meeting. All project team members worked to serve the Project and the Team. •	What is working well? What is not working? •	What are the Key Issues and Recommendations? Formal partnering sessions were held every six (6) months on the Project as well as team lunches to celebrate completion of milestones such as the opening of new Del Cerro ramp or the completion of a new stage within the Project. The CM team recognized the customer service level required by the client OCTA and assisted the client in as many ways as possible whether in scope or not. The team expended a great amount of time trying to head off issues with utility companies, local residence and local business owners to reduce the amount of effort the client would need to expend despite the client having their own public affairs staff. The CM team was able to accomplish this by building relationships with the aforementioned stakeholders making resolution of issues quicker and easier without the client needing to be involved until the issue was resolved while all the time being kept informed. Throughout construction, The Project Team made efforts to reduce the impact of the Project on drivers, businesses and residents. Majority of the Tustin-Rose Avenue and Orangethorpe Avenue remained open to drivers the majority of the duration of construction. A public outreach program was in place to provide advance notification of closures and other construction activity. Jacobs assisted the OCTA Public Outreach Team which issued regular Construction Alerts, maintained a website, produced videos of the work in progress and to remind the public to be safe while traveling through the construction zone, established and monitored a telephone helpline, and communicated information via Twitter and Facebook. Reminders about safety and lane changes were included in the public outreach program, and speeds were reduced to 25-35 miles per hour in the construction zone to promote safe working and driving conditions. Regular meetings were conducted with the local business community, stakeholders and the adjacent residents. Jacobs performs Client Expectation Surveys (CES) at the beginning of each project to determine each client’s specific needs and concerns. We follow this up with Client Satisfaction Surveys (CSS) approximately every six months for the life of the project to listen to our clients concerns and feedback. The Jacobs team averaged above 95% customer satisfaction throughout the project duration OCTA is consistently happy with our ability to proactively look for issues and resolve them before major cost and schedule impacts are realized. Please refer to a reference letter from Ross Lew, OCTA Program Manager, in the attachment. The Tustin-Rose Grade Separation Project Team delivered a successful project to the drivers, business and residents. The overcrossing, which borders the cities of Placentia and Anaheim, allows drivers to travel safely and smoothly over the tracks without having to wait for passing trains. The Tustin-Rose Grade Separation Project included raising the Tustin/Rose Avenue arterial over the existing dual BNSF railroad tracks, Atwood Channel, and Orangethorpe Avenue via one 450-ft long 4-span, 6-lane wide bridge founded on ten 8 ft CIDH piles and 107 steel driven concrete piles. The bridge is innovative in that it couples a typical Caltrans box girder bridge with pre-stressed concrete girders over the BNSF tracks to eliminate the need for falsework adjacent to the railroad tracks. This project included raising the Tustin/Rose Avenue arterial over the existing dual Burlington Northern Santa Fe (BNSF) railroad tracks, Atwood Channel, and Orangethorpe Avenue via one 450-ft long four-span, six-lane wide bridge founded on ten 96-inch Cast-In-Drilled-Hole (CIDH) piles and 107 steel driven concrete piles. The bridge is innovative in that it couples a typical Caltrans box girder bridge with pre-stressed concrete girders over the BNSF tracks to eliminate the need for falsework adjacent to the railroad tracks. 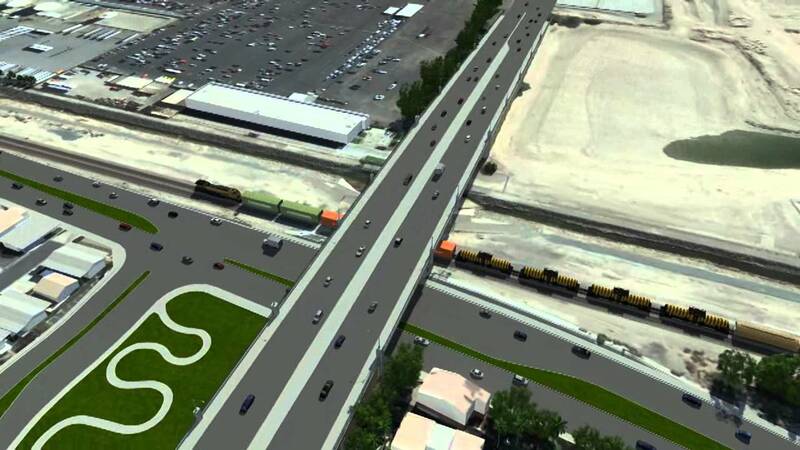 The project included a time- sensitive, four-lane temporary bypass road with an on-grade railroad temporary crossing and a temporary bridge spanning Attwood Channel.